Having been asked several times whether my creams offer SPF protection, the shop now offers any of the six creams with a few additions for them to offer more sun protection. On those occasions, or even every day, when you know you are going to be outside and would like some protection from the sun's rays, this cream is an ideal alternative to the moisturizer you may usually use on a daily basis. Being this version uses heavier oils such as wheat germ oil and avocado oil, along with the zinc oxide, you'll find it rich and thicker than the original creams. However, it absorbs nicely without a white residue. As with any moisturizer, play around with how much to use for your own skin type. There are several oils, butters, essential oils, and other natural ingredients that provide natural sun protection, even if low on the SPF scale . As a part of your homemade cream they not only moisturize and nourish the skin, but offer some protection against the rays of the sun as well. These creams have not been tested by the FDA to scientifically rate their SPF levels and are not being promoted as a sunscreen. 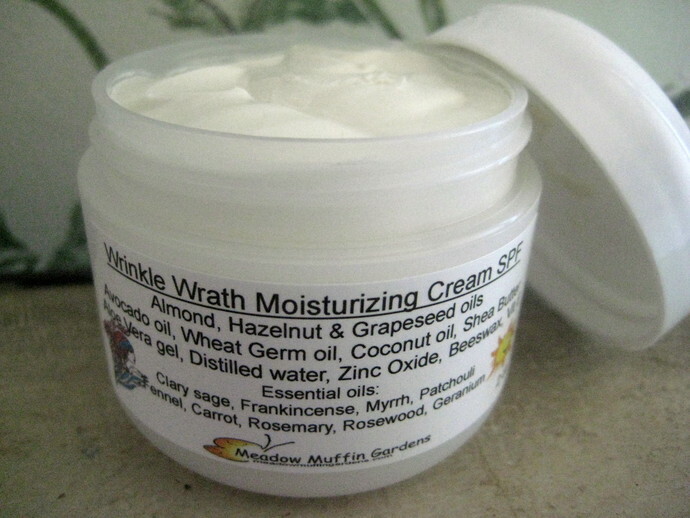 They are moisturizing facial creams with the additional benefits of their ingredients having their own SPF factor in blocking the sun's harmful rays along with the sun blocking properties of zinc oxide. The amount of zinc oxide used is said to give an SPF of about 15 - 20 but again I cannot make any claims. The original cream formulas contain nourishing oils that in themselves may contain a low SPF factor. Being both coconut oil and shea butter offer great protection I'll be using both unless you request a choice between one or the other as I usually do with the cream listings. Avocado oil and wheat germ oil will be added since they are both very high in vitamin E which is a powerful antioxidant. Zinc oxide acts as a physical blocker which deflects the suns rays like a mirror. For those concerned with the comedogenicity (pore clogging rating 0-5) wheat germ oil is a 5 and avocado oil is a 2. The wheat germ oil is added at only 5% which shouldn't be enough to cause problems. Zinc oxide is no problem at a rate of 1. Below is a list of the benefits and natural SPF of some popular ingredients used to increase protection. Coconut oil is known for its ability to help skin retain moisture. This wonderful hydrator feels so cool on parched skin. 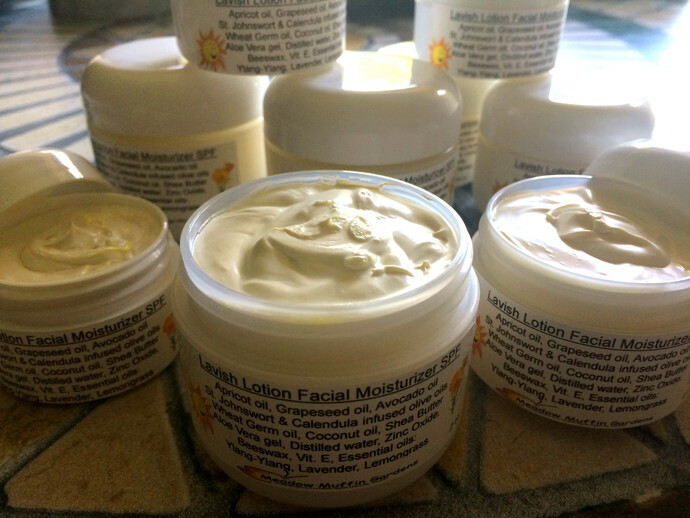 Shea butter is a heavy butter that once it penetrates is very therapeutic for dry damaged skin. 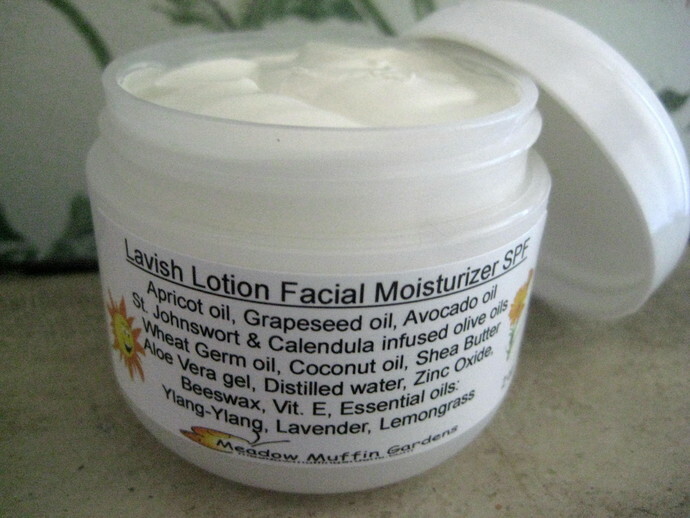 High in fatty acids needed to retain moisture and elasticity. Contains cinnamic acid, which naturally filters UV-B radiation. Avocado oil is a heavier oil full of vitamins, minerals and anti-oxidants, and is great for repairing body tissue and maintenance of healthy skin. Hazelnut oil is a lighter oil which is slightly astringent, nourishing and quickly absorbed into the skin. 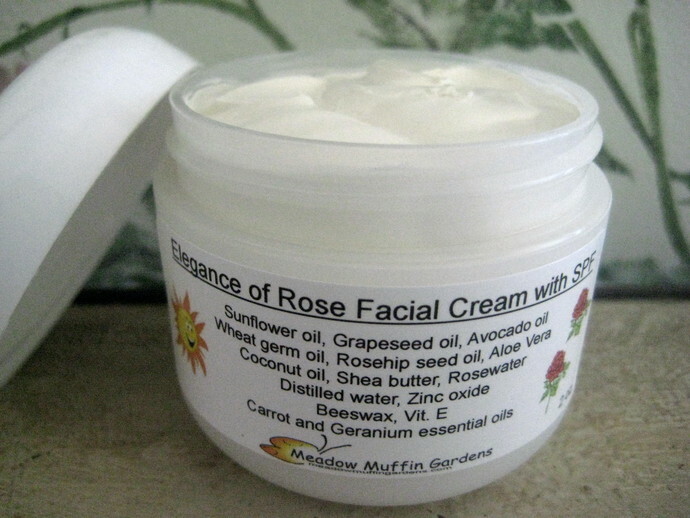 Excellent and popular for skin care. Nourishing and absorbs nicely. Wheatgerm oil is one of the best sources of natural vitamin E and when applied to the skin acts as an antioxidant to prevent free radical damage. Very cooling and refreshing, Aloe's anti-inflammatory properties offer protection from Vitamin C and E so helps with skin that already had too much sun. 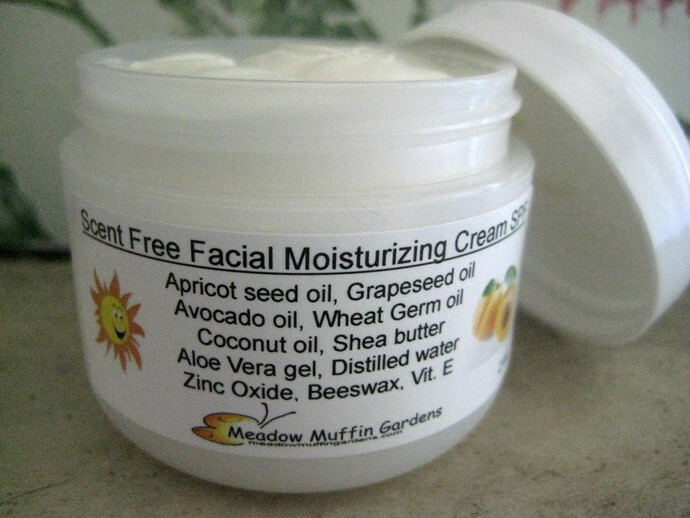 Vitamin E is added to all the creams as a way to help protect against oxidation in the oils. It is also a neutralizer of free radicals which helps with sun exposure. Zinc oxide is known to be safe. The micronized particles of this mineral form a physical blocker in sunblocks and deflect the suns rays like a mirror. The particles sit on the outermost layer of your skin, scattering and absorbing UVA and UVB rays, protecting the skin below. The zinc oxide used is non nano zinc oxide. Popular with commercial sunscreens is to use nano or micronized zinc oxide that has been treated to reduce the size of its particles. When added to sunscreens it does not leave a white film on the skin. The problem with this is that the particles are so small they can enter the body through the skin, causing potential health problems. Zinc oxide is often paired with titanium dioxide, which reflects light, but titanium dioxide is not included in this lotion because it has the potential to be irritating to the skin. Carrot seed essential oil has significant antioxidant value, high levels of vitamin A and provides natural sun protection. Beeswax if added to thicken the oil blend into a cream but being it has water-repellent properties, it helps provide a protective coating for the skin against the sun and wind. 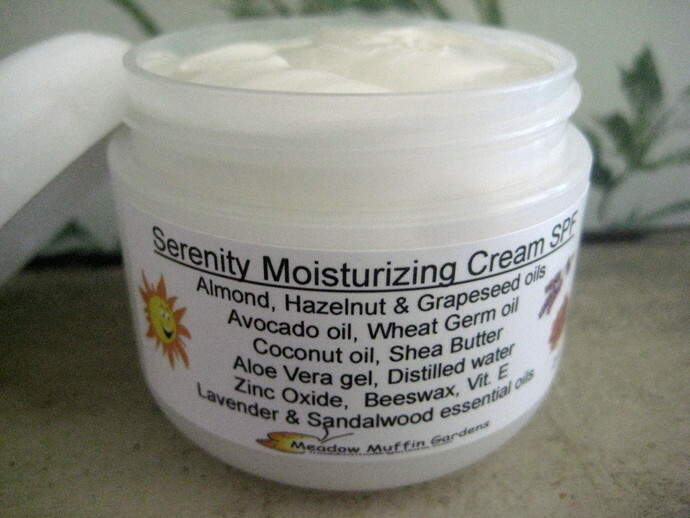 At checkout you can choose which type of cream you want and in what size. They are offered in 1/2 oz, 1 oz or 2 oz.